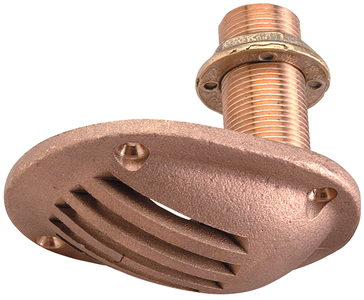 Boatersland Marine > Plumbing/Ventilation > Marine Strainers > Perko 0065DP4PLB Intake Strainer - 1/2"
Perko 0065DP4PLB Intake Strainer - 1/2"
Cast bronze. Screw size is #8. Strainer is 3" x 4". except for 65DP7PLB which is 3-1/4" x 4-1/4". Includes nuts. Max Hull Thickness - 2-1/4"